The Strange and Surprising Story of Saints – Super-Christians? Or Superfluous? 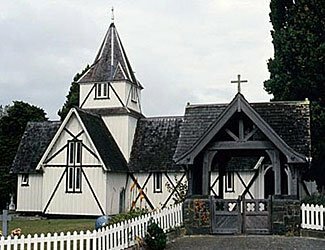 The small All Saints Church in Howick, NZ; constructed in 1847. If you’ve been to a traditional Catholic or Protestant church, you may (or may not) have noticed that it has a name. These names are typically those of saints. The first ever church this writer went to, as a young boy, was a very small and humble church in a small town (see picture). But it went as far as to ambitiously call itself “All Saints Church” – a name similarly adopted by many thousands of other churches (Google returns 3.7 million results when searching for that exact text string). Which begs the question – how many saints are there? Would you care to guess? If all the saints were to visit the All Saints Church pictured above, on the same day, they’d not only overflow out of the church, they’d fill up the church yard as well, and spill out onto the road outside. According to this article, there is an unknown number of saints (which is, in itself, a surprising situation) and in total, something in excess of 10,000. That is many more than most people expect. In general, few of us really pause to question the notion of sainthood, and just accept it at face value. We all know about saints, don’t we. Or do we? Who/what exactly is a saint? The answer to that question is both strange and surprising, and it is difficult to tell in full detail without unavoidably raising new and uncomfortable questions, the answers to which are well beyond the scope of this article, in the process. Just to remind you, our three core beliefs include the belief that the Bible is the Word of God, the key and ultimate source of all Christian understanding, and our seven top-level principles include a restated version of that, asserting that there are no other documents that supplement the Bible as the source of our faith, beliefs, and how/what we worship. So, naturally, whenever trying to understand anything, we should – we must – seek the answer within the Bible. If the Bible’s guidance is confusing, we can then fairly try to understand it as best we can, and look for the advice and interpretation offered by respected Biblical scholars and theologians. We remind you of this, because what follows may surprise you. The Bible does indeed refer to the concept of saints. According to Strong’s Concordance, the word “saint” appears five times in the KJV, and in the plural form, “saints”, another 95 times. Interestingly, in four of the five times the word appears in singular form, it is clear that it is in the context of multiple saints, and that is our second clue that the common concept of saint – as an almost unique individual of extraordinary merit – might be mistaken. The first clue is to wonder just how extraordinary the merit to become a saint may be if there are over 10,000 saints – that’s an average of 5+ new saints every year, and the rate of adding new saints seems to be increasing. Back to the Bible, most of the references are in the New Testament, and it appears that in all such cases, the term “saints” refers simply to all the members of a church. See, for example, Acts 9:32 and Colossians 1:2. Everyone becomes a “saint” as soon as they accept Christ and join him in his church. None of the mentions of the word saint(s) seems to refute this interpretation. Rather than saints being the most – well, ‘saintly’ – of Christians, we are even told about how they needed to be equipped for their ministry – yes, church members were saints first, and then started to actually do good works second (Ephesians 4:12). The good news is that the Catholic church acknowledges and accepts that originally the term saint did refer to all Christians. But in the “early years” the term was somewhat repurposed by the Catholic church and used to refer to people who were “eminent for holiness” (as per the “Modern Catholic Dictionary”). There is a lot to digest and evaluate in this single short paragraph. Let’s go through it sentence by sentence. By the year 100 A.D., Christians were honoring other Christians who had died, and asking for their intercession. Let’s accept the first sentence as a probable fact for the purpose of our analysis. It has no bearing on any of the authority for the Catholic view of Sainthood, and whether it is correct or not. It merely tells us when the practice started. This first possible fact doesn’t help us understand the validation of the Sainthood concept at all. This statement doesn’t really explain anything, it is just another introductory comment. Rhetoricists would note it as being a device to imply even-handedness in what follows. but it was part of Christianity from the very beginning. Now, at last, we are being given a specific and relevant claim. Let’s see if we can find anything to prove this claim (seeing as no proof is offered on the Catholic Church website). The ‘very beginning’ of Christianity was somewhere around 27-29 AD when Jesus started his ministry. We can surely all agree on that. We know for a certain fact that honoring saints was not part of Christianity from the very beginning, for two reasons. First, the Bible tells us that everyone was a saint (which the Catholic church acknowledges, see above). In the context that everyone was a saint, clearly there would not be any point in everyone honoring themselves; that flies completely in the repeated admonishments to be humble – see, for example, Philippians 2:3-4. Second, the most respected of all the early Christians, the Apostles personally chosen by Jesus Christ, and the miraculous works that attested to the special powers of ministry and witness they were given, repeatedly told the early Christians not to worship them, or anyone else, but to focus exclusively on honoring and worshiping God and Jesus as his son (for example, Acts 10:25-26 & 14:15). The Book of Acts, cited in the previous paragraph, was written sometime around AD 80-90 and covers the time period of about 30-60 AD. The Epistle of Paul to the Philippians, mentioned in the paragraph prior, was written in about 49-51 AD. So, it seems that whatever the early years of the church may actually be, during that time Christians were being admonished not to honor other Christians who had died or to ask for their intercession. The only mentions of such practice, in the Bible, are when the Apostles say not to do so. We invite/encourage rebuttals on this point. As a matter of fact, this practice came from a long-standing tradition in the Jewish faith of honoring prophets and holy people with shrines. We found nothing to confirm this statement within either the Old or New Testaments. But we’re unfamiliar with many aspects of the Jewish faith and the history of their many thousands of years of worship, and wanted to cast the widest net, outside of the Bible, to search for proof of this claim. We found this book but its five specific references relate only to shrines considerably after the start of the Christian era. Here’s a rather messy set of answers on Quora, about whether Jews worship Moses. Moses is probably the greatest Jewish prophet and so if they were to worship anyone, it would surely be him. The Quora answers seem to suggest that not only do Jews not pray to/via Moses, they also don’t have shrines. To be fair, it is hard to prove a negative, and perhaps our lack of success in finding material to support the Catholic claim was due to our own lack of knowledge and poor research. So we reached out to an internationally respected scholar in the field of Jewish History and Judaic/Talmudic Studies, Professor Meir Bar-Ilan, at Israel’s second largest university, the Bar-Ilan University in Tel Aviv, to get his advice on the topic. 1. In the Bible, there is no model of honoring a prophet (maybe except the Shunammite who asked for her son). On the contrary, some went to jail and others got killed. From outer sources, we know that Jeremiah was stoned to death in Egypt (but can’t assure that). 2. Tombstones of prophets are known from Pseudepigrapha only (Vita of the Prophets). There is nothing like that in (rabbinic) Judaism. The first time such a practice is known – going to a prophet grave and praying there – is from around the 8th – 9th century. 3. The first Jewish hagiography [a biography praising a saint] was written around the 13th century (except, maybe, Words of Gad the Seer, a book I edited and which may date to the first century). 4. Only in later Judaism of the 16th – 20th centuries, can one find hagiography in a way similar to that of Jesus. 5. In rabbinic Judaism, the title ‘saint’ is reserved to martyrs only [with very few exceptions]. 6. Though officially forbidden in normative Judaism, some Jews go to tombs till this very day and pray to the saints there asking them to be mediators before God. So, it seems that an internationally respected Jewish scholar is unaware of this “long-standing tradition”, and such Jewish traditions as may exist today are not mainstream, and not common, and not endorsed by main Jewish thought! Even if the Catholic claim, above, is correct, is copying the practice of another religion a good basis for any practice in the Christian faith? Christianity is different to Judaism. The Christian New Testament overrides any points in conflict in the Old Testament. The clear instructions of the Apostles not to worship themselves or anyone else other than Jesus and God overrule any conflicting practices of the Jewish faith. Additionally, the Jewish faith is ambiguous about its views of what happen to people after they die (a surprising thing for us as Christians where our religion is all about our future life after death). Noting one of the big elements of the Catholic Saint process is a claim that Saints go straight to Heaven and are with God (see the next point, below about the special status the Roman Catholics give their Saints), there is no support of that claim (that we are currently aware of) within the Jewish faith. So even if it is true that the Jews formerly erected shrines in pre-Christian times, that doesn’t support the evolved view of Saints as going straight to heaven, and therefore being possibly able to speak to God for us. Bottom line – we see no evidence to support this claim, and even if there were evidence of Jewish shrines, etc, we wouldn’t consider it as a valid reason for Christians to do the same. Again, we welcome rebuttal if you have any. The first saints were martyrs, people who had given up their lives for the Faith in the persecution of Christians. This is a statement to be viewed with caution. But there is no record of any unusual veneration being accorded to martyrs, and in general, the Bible is primarily forward-looking, considering the present and future of the church and its members, not the past. It is true that the first Roman Catholic church initially had Saints earning their sainthood by way of being martyrs, but the first martyrs – who were “normal” Christian saints, were not venerated as “Saints” in the early Christian era. On the face of it, there should be nothing wrong with honoring high achieving and heroic Christians for their accomplishments, just the same as we also honor people who excel in other fields, whether it be in the field of the arts, sciences, politics, military, or other types of public service and achievements. We do this to note the accomplishments done by such people, and perhaps to encourage others to aspire to emulate them. But we do have to consider the steady urging in the Bible that we should be meek and not seek out earthly rewards, and to be content with our heavenly reward that would follow (eg Colossians 3:12, Matthew 18:1-4), and of course, the distaste that the Apostles showed when people wished to honor them. There is also a slight worry that being awarded earthly honors rather than heavenly honors may make some people focus more on earthly rather than heavenly goals so as to win such awards. Putting those concerns to one side for now, we’re happy to see the Catholic church honor outstanding members and their outstanding achievements, even if their justifications for doing so seem a bit specious. But the Catholic church then takes things a step further, and that’s the point where we have greater difficulty. They claim that these people get ‘special treatment’ after dying. The study of what happens to us after our death, termed “eschatology”, is somewhat speculative, relying on only brief mentions in the Bible and the somewhat puzzling content in the Book of Revelation. But, on balance, it seems reasonably fair to say that when we die, one of two things might happen. Either we instantly join Jesus, or our souls become in a state a bit akin to being unconscious, and we are awakened at some point during the Second Coming. There is no Biblical indication that some dead people get special treatment. All who have accepted Christ as their savior seem to be promised the same outcome. John 3:16 & 3:36 make open-ended offers to everyone, and there is some explanation in 1 Thessalonians 4:13-16 about the actual process at end times. In particular, note the second part of verse 16 “…the dead in Christ will rise first”. This does not indicate any sequencing of resurrection, and knowing the power of God as we do, probably it will happen instantly for us all, at the same time. Roman Catholics sometimes cite Revelation 5:8 in support of their belief that prayers to saints get special treatment. The verse refers to golden bowls full of incense, which are the prayers of the saints. But, and it is a big but, remember that in the Bible, all Christians are saints, indeed, the NIV translation of that verse says “…the prayers of God’s people” rather than the more common “…the prayers of the saints”. Nothing in any of this indicates any special treatment for Roman Catholic Saints. They died in Christ, just like you and me, and they will arise, just like us, and as far as the Bible seems to tells us, the Roman Catholic Saints will rise at the same time as the ‘regular’ Christian saints. Originally it seems that the first Saints were martyrs – people who died as a result of their faith. Sainthood was subsequently extended to “confessors” – people who affirmed their faith at a trial but who were not executed for it. The Seventh Ecumenical Council in 787 AD declared “we adore and respect God our Lord; and those who have been genuine servants of our common Lord we honor and venerate because they have the power to make us friends with God the King of all.” So we see that special status was now being given to “genuine servants” and also the claim that these “genuine servants” have power to make us friends with God. That’s where things really start to veer off course. What more special power do we need than that granted to us by Jesus Christ? Where in the Bible is there any reference to anyone other than Jesus having power to “make us friends with God”? We can understand the need to come up with a formal process to label people as Saints, but we find it extraordinary that mere mortals in the Roman Catholic church have taken it upon themselves to decide which people get some special extra powers in Heaven. Surely, if indeed such things exist, it is not for us imperfect mortals to decide, but for God himself to decide. The eligibility requirements have changed over time as well, but strangely, those have become more liberal rather than more strict. Formerly there needed to be at least 50 years elapsed between a person’s death and their consideration for first being beatified and considered blessed, and subsequently to proceed on to being canonized and made a saint. Now only five years need to pass, and indeed, even five years was too long to wait to start the process for Pope John Paul II, subsequent to his death in 2005, and a process that formerly averaged 181 years (between a person’s death and eventual canonization as a saint) was compressed down to nine years, with John Paul II being labelled a saint in 2014. It seems that being a popular pope these days accelerates one’s path to sainthood. Pope John Paul II’s predecessor, John Paul I (who spent a mere 33 days in office and so never really created much of a presence), is still progressing down that path, and the pope before him, Paul VI, is to be canonized on 14 October 2018, 40 years after his death. It also seems that becoming a saint these days is one of the almost automatic benefits of being a pope. Although it was very rare, historically, for popes to be canonized (the last 1,000 years have seen only seven popes made saints), the last six popes are all either already saints or going through the process. This is an excellent article about trends in canonizing saints. The fast-tracking of Pope John Paul II’s path to sainthood was in response to public demand that he be made a saint, immediately he died. Yes, he was a popular pope, although some detractors would point out that it was on his watch that the scandals of sexual abuse within the church were nurtured in the dark and allowed to continue with no action on the part of church leadership. If popularity is to be a measure of sainthood, as apparently it was in this case, then we should have a Saint Justin Bieber and an entire family of Kardashian saints. But the church is not run on the basis of popularity, and forgiveness of sin and a pathway to Heaven is also not based on public acclaim. Roman Catholic saints originally came in two types – martyrs and confessors of the faith. Martyrs require one posthumous miracle to occur as a result of their invocation, confessors of the faith formerly required four, but since 1983, only two are required, and in one recent case, Pope Francis waived the need for two miracles, accepting only one to confirm the elevation of Pope John XXIII to sainthood in 2014 (51 years after his death in 1963). The miracles required to qualify as a Saint aren’t exactly massive in nature, either. The two miracles to qualify Pope John Paul II as a saint were a woman who survived a brain aneurism, and a nun who recovered from Parkinson’s disease. It is also surprising to see an accelerating number of people being canonized as saints – for example, Pope Francis canonized 813 people all in one single group – the Martyrs of Otranto, people who were beheaded by Muslims in 1480 for refusing to convert to Islam. That mass-canonization creates so many questions. Did someone examine the lives of each and every one of the 813 martyrs? Do we even know their names! Alternatively, if the act of dying as a Christian martyr is enough to guarantee you Sainthood, why are other martyrs, before and after this group, being passed over? One more thing – while in some respects, becoming a saint appears to be simpler than before, in 1968 the Catholic church reviewed the status of some of its saints, and withdrew their sainthood, or demoted their status (apparently there are different levels of saints). This has included the very well-known St Christopher, the patron saint of travelers, as well as St George (the dragon slayer) and Saint Nicholas, the person who originated the Santa Claus tradition. If the process by which people become saints is puzzling, a subsequent reversal is even more puzzling. You might answer “Yes, of course they are – that is the entire underlying definition of what a Saint is”. In Roman Catholic terms, you’d be completely correct in saying that. But, let’s look at it instead from a Biblical perspective, and how God views the people he welcomes into his heaven. We are told that everyone has sinned (Romans 3:10,23) and that the only way anyone can get to heaven is via Jesus and accepting his gift of salvation (John 14:6). In other words, we are all fallen, we are all sinners, and it is by Jesus’ salvation, not our good works, that we get welcomed into Heaven. (Roman Catholic) Saints are no more special than ordinary (Christian) saints like you and me. We are told we can pray for each other, but we are not told to ask a dead person – a Saint – to intercede for us. The word “only” clearly is implied in the phrase “only one God” and by the same turn, in the phrase “only one mediator”. Otherwise it would have said “one God but many mediators between God and men, including the man Christ Jesus”. Neither also could it be taken as saying or implying “one God and one main mediator and also some lesser mediators, the Saints according to the Roman Catholic church”. While that verse is talking about salvation, it is not unreasonable to consider it applies equally to prayer. One more perspective, from Philippians 2:9. This begs the question. If praying in the name of Jesus is invoking the most exalted person with the ‘biggest’ name, why wouldn’t we always do that, rather than try to route our prayers through a Saint who unquestionably would be on a lower level? Our unavoidable conclusion is that while Roman Catholic Saints may have been very good people on Earth, they too are no better than us in God’s eyes – they too have sinned, the same as us, and it is only by the equal love of Jesus that we are all saved. They are accorded no special privileges in Heaven, indeed, in the perfect state which is Heaven, by definition everyone must be the same, because if there are varying degrees of perfection, then there is also imperfection. The good news is that, in Biblical terms, all Christians are also termed “saints”. But the word “saint” has been repurposed by the Roman Catholic church, or perhaps narrowed in meaning. A Roman Catholic “Saint”, at least for the last 1000 years or so, is someone who has been approved by the church a person who will hold a special influential position in Heaven, and as someone who is in Heaven now, and able to intercede on behalf of people who ask them for assistance. Although the Catholic church says this concept dates back to the early church, and even prior to that, to Jewish times, we see no evidence to support that claim, and to the contrary, abundant evidence that such practices were prohibited (in Judaism) and frowned upon (in Christianity). We also see no Biblical support for the concept of Saints having a special place in heaven, superior to that of other saved humans. And so, if you have an important prayer (and, aren’t they all), better you address it directly to “our main man” – God himself, or to his “off-sider”, Jesus Christ. Both are eager to hear from us, and don’t require us to seek any additional help in communicating to and with them. Cut out the middle men. Go straight to the top!